Starting a business can mean a shoestring budget and limited resources. Office Zone now makes it possible for small businesses to create professional advertising materials in-house. Outsourcing business cards to a print shop can be costly due to minimum quantities for personalized and customized cards. Office Zone offers new business card cutters that let people print cards from their home computer and cut the needed amount in minutes. 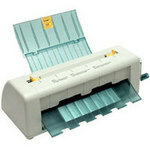 One such business card cutter is the Cardmate business card cutter (http://www.officezone.com/cardmate.htm). One of the most essential parts of getting a business up and running is getting the business or individual’s name out to people who may find the offered services useful. Paper folders are also useful to a starting business (http://www.officezone.com/fold1.htm). They can be used to fold hundreds of documents at a time with little effort on the part of the user. This is ideal for folding brochures, booklets, mailers and other business oriented literature. Office Zone also recommends other pieces of equipment such as laminators, paper cutters and binding machines. Printing fliers, mailers, brochures and other literature is also an important part of getting a business going. Using a standard copy machine can be costly and the price of toner stays the same no matter how many copies are being produced. Digital duplicators, much like the old hand-crank mimeograph machines, use ink that is far less expensive than traditional toner-based copy machines (http://www.officezone.com/digital-duplicator-cost-guide.htm). Digital duplicators can be found here: http://www.officezone.com/dupli1.htm. If money is an issue, there is a solution. “Many of the people I talk to don’t have the money needed to purchase necessary office equipment. Leasing has been an effective way to get people the equipment they need with little money up front,” says Aaron Thacker, Sales Supervisor for Office Zone. Office Zone continues to offer advice and is happy to offer free advice to anyone starting a small or home-based business.